The above photo is of an abstract painting done with the idea of letting your 'inner child' play. It was fun and freeing to my creative spirit. Letting it go. Let It Be. Welcome to our Monday post and lots of creative works, photography, poetry and art. 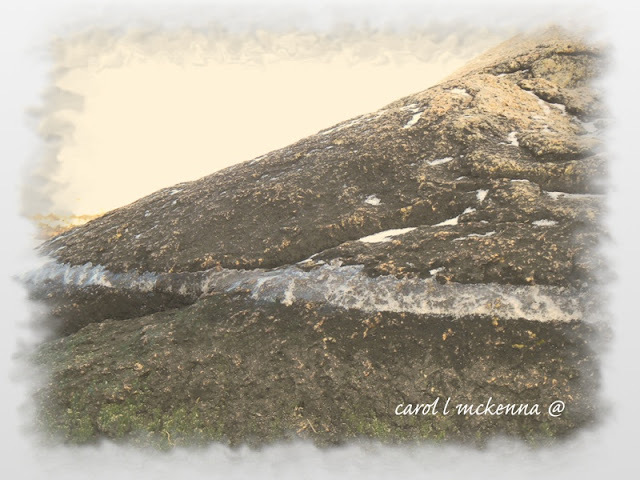 There is the playful painting, the photo montage and the cold wintry ice, snow and beach rocks photos. We try to walk everyday and explore and play even in the cold. Such beautiful photographs and sweet pup!!! I hope we see at least a little snow this year. Visiting from Mosaic Monday. I LOVE that invitation, and I accept. Thank you! I especially love the haiku. There is much inspiration here! Hi there visiting from Mosaic Monday ... wonderful post ... and your little furry assistant is really adorable.. Yes let's!!! Especially the giggling!! Love the photos and today's haiku is one of my favorites. I want to be young today, too! Those buildings look so delightfully sunny in contrast with the white of the snow! To play in the spirit of a child is a wonderful feeling of abandonment and freedom! Lovely haiku! Carol you always inspire me to "run free" with art--to just go for it! As usual your art is lovely. Hi Carole, Nice to meet you. Thanks so much for stopping by my blog and your nice comments. You have some beautiful photography too. I didn't see where to follow you so I am adding your URL to my blog roll and hope that it shows up. Being young today - what a great idea! What I lack in youth I make up for with immaturity. What a nice post; you've covered a bit of everything from your inner child to a fun haiku. 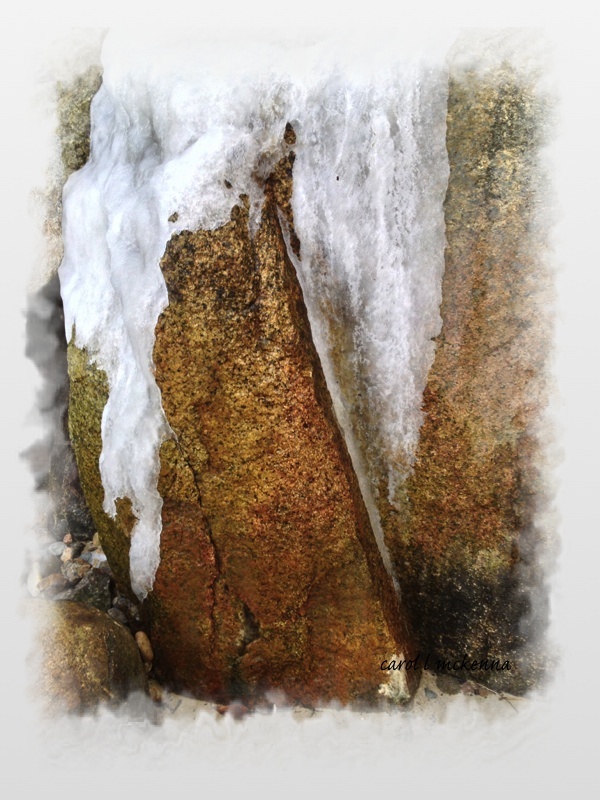 I really like the contrast between the texture of the rock and the ice. A most interesting image! And I find it really hard to imagine ice on a beach - living here in Australia. Lovely inspiration and post. I love you painting and haiku! I wish I was as creative as you. Have a happy week ahead. I always find myself a child inside the jungle. How sad I am not anymore after returning to civilization. Dear Carol, you wrote in your haiku 'let's be young today' how beautiful these words are. Thank you very much for it and your creativity. Have a lovely week. beautiful thoughts and images and a lovely way to start the week. Thank you. Take care and have a wonderful creative week. I am joining you from Mosaic Monday. Oh I love those mellow yellow shots! Gorgeous! I remember a caption to our 3rd grade art - "yellow makes you feel cold." What a great sample of your creativity! Your abstract painting is delightful, and I love your rock images. Have a wonderful. childlike week! Love the cheerful yellow in your collage! It certainly looks like you are in the midst of a winter wonderland. Love your drawing. lots of good stuff! Love the flower laden bicycle! Love that Haiku! Gorgeous shots and so glad you linked up! neat photos.....I expected something different about children from you, but I love the way you took the prompt - Let's be young every day! that is some amazing house! Such gorgeous photos, painting and haiku! I didn't realize until now, I've visited Cape Ann a couple of years ago. I took the train to Rockport and walked around there. Oh, and thanks for the haiku, too. love your abstract and your photos, and that beautiful haiku!! You were playing all right! In many ways, by the way! Have a happy week! Love your thoughts about the inner child. Your watercolor and haiku are so vivid and light ~ Making the happiness bubble inside like those days in the childhood ~ just living the present moment! It's so uplifting to visit the Creative Harbour ~ have a great week, Carol! Love the 'inner play' work. And I can't believe...ice on the beach? Salt water? Freezing? I must be mighty darned cold. 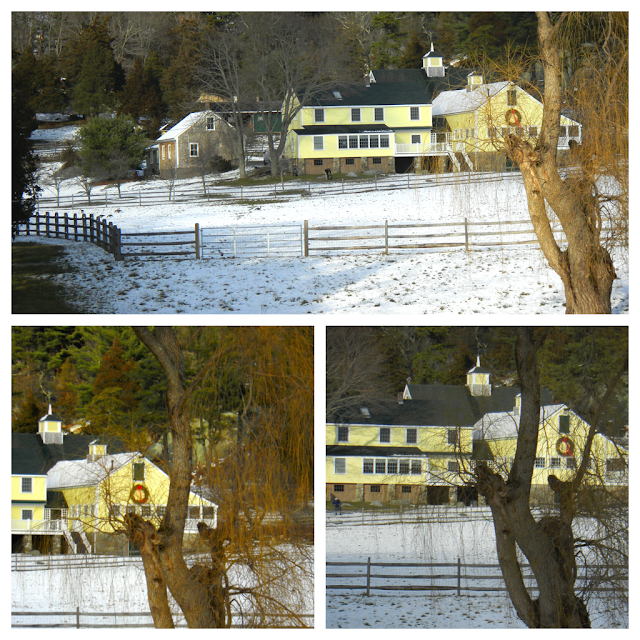 the yellow houses are beautiful--i love this shade of yellow. your macros of rocks and ice are fabulous! Wouldn't that be something ... a child again for one day. Nicely crafted. 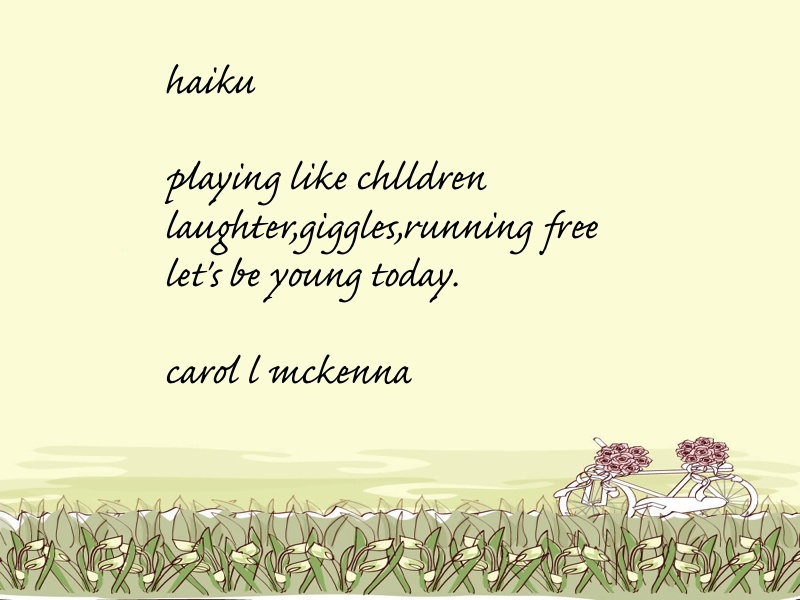 I love that you let your inner child play and a haiku for playing too! Such great art and I love how you incorporate it into your pictures--very inspiring. Lovely images. Have a fabulous week! Lovely pictures and I like your haiku on children.